Context: Many people around the world strive to achieve younger-looking skin. This is often promised by topical treatments. Oral treatments for skin ageing have been unsuccessful due to their constituents being broken down by acid and enzymes in the gut; however several studies have shown that hydrolyzed collagen is absorbed in the gut and then delivered to skin and joints through the blood stream. Aims: The aim of this study was to determine whether an oral nutritional supplement drink containing hydrolyzed collagen and other specific ingredients reported to have antiageing properties, would have a positive effect on skin wrinkling, elasticity and hydration. Materials and Methods: A double-blind, randomized, placebo controlled clinical trial was conducted on healthy subjects to assess whether this oral supplement could improve certain specific skin properties of post-menopausal women, namely depth of facial wrinkles, skin elasticity and hydration. Results: The evidence provided here proves that the combination of specific ingredients present in this nutritional drink acts to significantly reduce the depth of facial wrinkles and increase skin elasticity and hydration. Conclusions: This study shows that the oral nutritional supplement consisting of hydrolyzed collagen, hyaluronic acid, and essential vitamins and minerals, leads to a significant improvement in wrinkle depth. It is also able to induce noticeable improvement in elasticity and hydration of the skin. There are many fundamental processes that lead to the changes observed in aged skin, such as alterations in the turnover of the extracellular matrix proteins within the dermal layer of the skin, a rise in the inflammatory markers, and reduced blood flow. Fine lines begin to appear when the breakdown of collagen within the dermis exceeds its synthesis. In fact, as the main component of skin, together with elastin and hyaluronic acid, collagen has a key role in providing integrity and elasticity to this organ. The first evidence that collagen peptides may have a chemotactic activity on fibroblasts was presented by Postlethwaite et al. in 1978. In this study the chemotactic response of human dermal fibroblasts to type I, II, and III human collagens and collagen-derived peptides was observed with an in vitro assay. The result showed that all three native human collagens and constituent α-chains could act as chemoattractants for fibroblasts in vitro. In addition, di- and tri-peptides containing the hydroxyproline were chemotactic for fibroblasts. The authors suggested that both collagen and collagen-derived peptides might function as chemotactic stimuli for fibroblasts also in vivo and attract these cells to repair damaged tissues. Consumption of hydrolyzed collagen has also been shown to have beneficial effects in the skin. Three studies from Japan in particular have demonstrated a clear effect. The benefits of daily ingestion of hydrolyzed collagen (10 g) on skin hydration of 20 healthy Japanese women compared to the placebo group (19 volunteers) were evaluated by Sumida et al. In comparison with the placebo group, gradual improvement of water absorption capacity was observed through 60 days in volunteers who ingested collagen peptides. Matsumoto et al. presented results of a trial also suggesting that a daily ingestion of collagen peptides improve skin hydration. The authors reported subjective improvement of the skin condition of woman's volunteers after ingestion of fish collagen peptides for 6 weeks. The percentage of positive response between the subjects was very high. This study was followed by a double-blind placebo-controlled study by the same research group  on healthy women volunteers aged 25-45. In this study 2.5, 5 and 10 g of fish collagen peptide were administered and compared to the placebo. The hydration of the stratum corneum was measured at baseline and after 4 weeks. A significant difference was observed in subjects older than 30 years between the treated group (5 g and 10 g) and placebo. When administered orally, hydrolyzed collagen reaches the small intestine where it is absorbed into the blood stream. Several scientific studies have described the bioavailability of hydrolyzed collagen after oral administration in animals and humans. 14C-labeled hydrolyzed collagen was used in a study by Oesser et al.,  who investigated the time course of hydrolyzed collagen absorption and its subsequent distribution in various tissues in male mice. The test group received 10 mg of 14C-labeled gelatin hydrolyzate/g body weight, while the control group 14C-labeled proline, along with unlabeled gelatin hydrolyzate (10 mg/g body weight). The time course of radioactivity within the mice subsequent to absorption of orally administered 14C-labeled hydrolyzed collagen was measured. The results showed that about 90% of orally administered hydrolyzed collagen was absorbed within the first 12 h from the intake. Radioactivity in skin attained its peak values 12 h after the administration of 14C-labeled hydrolyzed collagen and in contrast to plasma, 14C-activity remained relatively high up to 96 h.
Through the network of blood vessels, collagen peptides are distributed in the human body, in particular to the dermis, where it has been proven they can remain up to 14 days. The function of collagen peptides on the migration and growth of mouse skin fibroblasts was investigated by Shigemura et al. in Japan. They reported that the number of cells migrating from the explanted skin increased significantly after treatment with proline-hydroxyproline (Pro-Hyp) peptide. They also showed that Pro-Hyp increases significantly fibroblasts growth. The aim of the present study is to evaluate the effect of hydrolyzed collagen together with a combination of other ingredients reported to influence key factors involved in skin ageing: namely collagen synthesis. A supplemented drink containing hydrolyzed collagen, hyaluronic acid, vitamins and minerals was given to a group of women. Females aged 45 years and above were considered as a useful cohort to study, with respect to skin ageing, as the quality of skin declines dramatically with age, especially following the menopause. Any intervention aimed at correcting the symptoms of skin ageing is therefore likely to have a greater effect in this target population. A double-blind, placebo-controlled study was conducted by an independent Clinical Research Organization (Wales, UK) between April and July 2012. Eligible subjects were Caucasian, healthy, nonsmoking females aged 45-64 years, who were not using other nutritional supplements. 18 females were enrolled into this study. 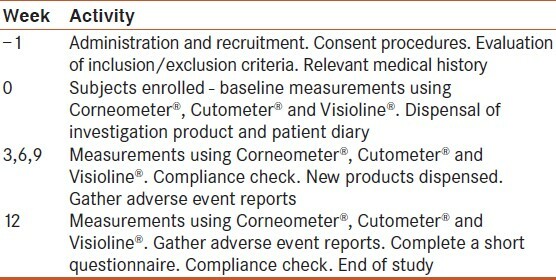 All subjects completed the study and no adverse events associated with the product were recorded. Subjects were allocated to two different groups according to a preprepared randomization code. Study sponsor, investigators and statisticians remained blind to the allocation in order to avoid bias. One group was given the test product containing all the active ingredients. 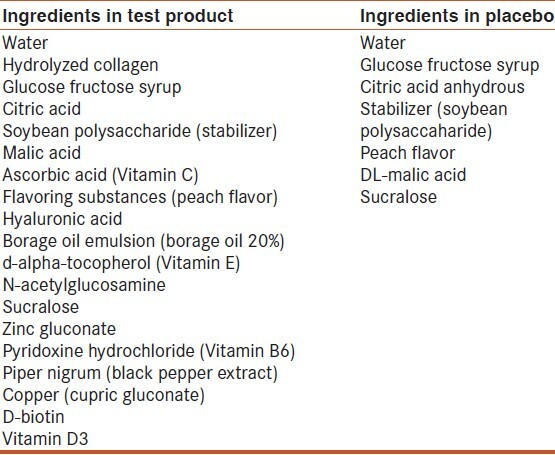 Test product was a fruit-based drink containing Vitamin C, Vitamin E, hydrolyzed collagen, among other ingredients, outlined in [Table 1]. The other group was given placebo drink containing no active ingredients. Subjects were asked to consume one dose of their allocated drink per day before breakfast for 12 weeks and to complete a diary card recording this. Subjects were instructed to keep the product out of reach of children and store it in a cool and dry place, away from direct sunlight and heat. Subjects were informed that once a bottle was opened, it had to be consumed within 24 h.
The properties of the skin on the inner aspect of the left forearm were assessed using a noninvasive instrumentation. All assessments were carried out at weeks 0, 3, 6, 9 and 12 [±2 days; [Table 2]. The assessments were for skin hydration, skin elasticity and skin surface micro-topography. In order to standardize the area for measurements, a template was constructed that allowed the marking of three adjacent test areas on the forearm corresponding to the three measurement techniques used. The position of this template on the forearm was by means of reference to the center of the elbow crease and the wrist. The Cardiff Independent Research Ethics Review Committee approved the study, and all subjects gave written informed consent. All the subjects were monitored for the occurrence of serious adverse events during the study. The primary endpoint of the study was the measurement of wrinkle depth. This was assessed using a skin surface micro-topography system (Visioline ® VL 650, Courage and Khazaka, GmbH) Cutometer: (Cutometer ® dual MPA 580, Courage and Khazaka, GmbH) Corneometer: (Corneometer ® CM 825, Courage and Khazaka, GmbH) were also measured. All instruments were calibrated according to the manufacturer's instruction before the start of the analysis. Study drinks were prepared on behalf of MINERVA Research Labs Ltd., in Japan. Drinks (50 ml units) were supplemented with the required level of individual active ingredients, except those used for the placebo group. To preserve study blinding, all test and placebo products were of similar appearance and were packaged and labeled in an identical way. Study data were analyzed using Wilcoxon signed rank test with the change from week 0 after 3, 6, 9 and 12 weeks. Results were considered significant if P < 0.05 (95% confidence interval) as calculated using R (www.r-project.com). P values for the differences between test group and placebo were calculated using Mann-Whitney U-test. The two nonparametric tests were used as the sample size was small and we could not assume that our population was normally distributed. Skin roughness is considered one of the main indicators of wrinkle depth. To assess wrinkle depth, silicone rubber replicas were taken from the inner part of the left forearm at the beginning of the study and at 3, 6, 9, 12 weeks, and analyzed at each time point using the Visioline ® equipment. The values were automatically calculated for each replica by the image analysis software. The mean starting values in both groups were very similar. As the study progressed, the mean values showed little variation. However by week 9, the group taking the test product experienced statistically significant reduction in average wrinkle depth, compared to week 0 [Figure 1]. This effect was not observed in the placebo group. A placebo effect was noted, and there was some reduction in the wrinkle depth in the placebo group, mainly after 6 weeks. However this was not significant when compared to week 0. Furthermore, with the test product, there was a gradual reduction in the depth of wrinkles from 5% to 8% by week 9, whereas with placebo there was no visible trend. By week 12 the values for placebo had increased and were close to those for the group taking the active supplement, which also returned to baseline values. 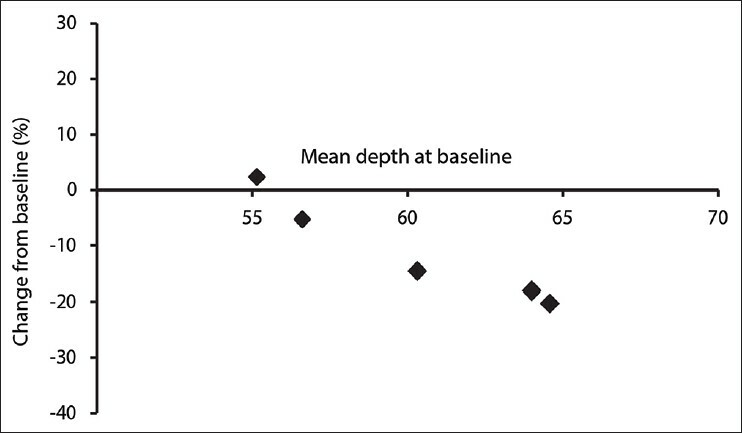 Interestingly, a clear correlation between the average values of wrinkle depth at week 9 and the percentage of reduction is shown: in fact, the greatest reductions in wrinkles depth were reported for deeper wrinkles [Figure 2]. Skin elasticity was measured using Courage and Khazaka Cutometer ® (probe aperture size 8 mm) at week 0 and week 3, 6, 9, and 12. Three measurements were taken from the site on the inner part of the left forearm. The data were sorted and the values for the Cutometer ® parameters R5 (net elasticity) and R7 (ratio of immediate retraction to total deformation-Biological elasticity) obtained. The average value for R5 and R7 was calculated for each subject at each time point. This value was used in subsequent analysis. Statistically, significant difference from week 0 was observed for the treated group after 6 weeks. The data continued to be significant at week 9 and week 12 [Figure 3]. This was seen with both net elasticity [Figure 3]a and biological elasticity [Figure 3]b. 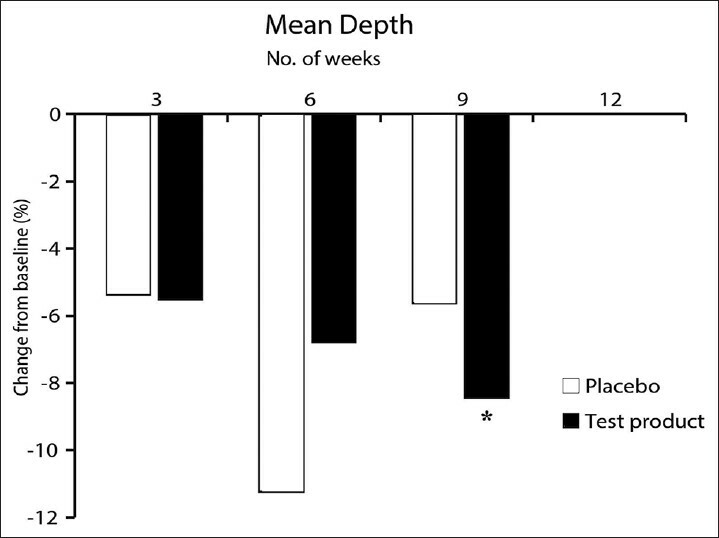 However, no significant difference was observed between placebo at week 6 and week 0. No statistical significance was observed between test product and placebo. Two illustrative examples of treatment over time are shown in [Figure 4], both for test product and placebo. In the case of the subject who was taking the test product a constant increase in elasticity was observed at 6, 9 and 12 weeks [Figure 4]a. On the contrary, this trend was not present in the subject treated with placebo [Figure 4]b. Skin hydration was also measured using Courage and Khazaka Corneometer ® at week 0 and after 3, 6, 9 and 12 weeks of intervention. Five measurements were taken from the site on the inner part of the left forearm and the average value calculated for each subject at each time point. This value was used in subsequent analysis. 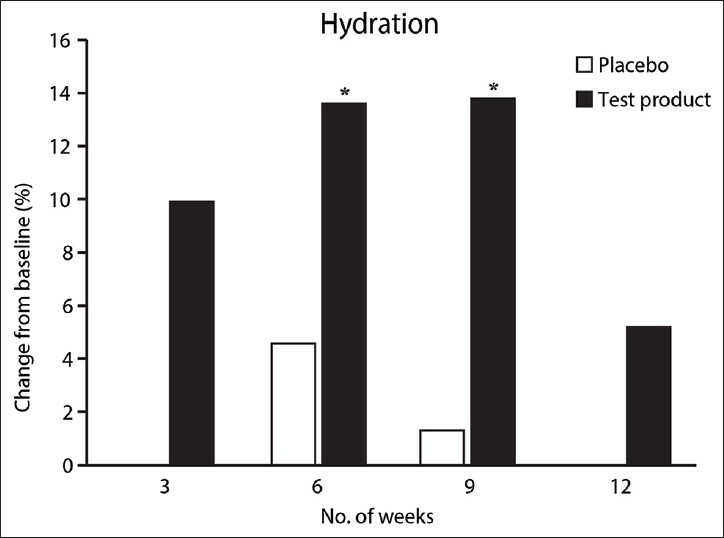 After 6 weeks, there was a significant increase in hydration from week 0 in people taking the test product [Figure 5]. However, no statistical difference was measured between placebo and test product at any time point (data not shown). The aim of this double-blind, randomized controlled study was to discover whether an oral supplement containing a select blend of ingredients, put together as a pleasant tasting drink, would be effective in improving skin properties. The investigation was carried out according to the principles of International Good Clinical Practice. The products were coded and provided to participating subjects at random. All subjects, investigators and statistician remained "blind" to the coding until initial data analysis was complete. A group of 18 postmenopausal women were asked to test the product, and the results were compared to a similar group of women taking placebo. The results show that a combination of hydrolyzed collagen and hyaluronic acid, together with other ingredients, when consumed orally for 9 weeks can significantly reduce the depth of wrinkles, whereas there was no significant reduction with placebo. In fact, there was 8% reduction in wrinkle depth in the group taking the test product, which was found to be significant (P = 0.037). By comparing baseline values at week 0 with wrinkle depth after 9 weeks treatment, we demonstrated a correlation between the two that is, the deeper the wrinkle, the greater the reduction in depth. This finding provides an indication to the possible mechanism of action of the product. Fine lines probably result from alterations in the surface of the skin or the epidermis, whereas deep wrinkles are formed by changes in the dermis. Thus, nutritional supplements that have an effect on the dermis will most likely reduce the deeper wrinkles to a greater extent compared with products that act on the surface of the skin. We also found that the specific formulation of nutritional ingredients within the test product, proven to have benefits on the skin, enhance skin elasticity. Even though, there was the lack of significant overall difference between elasticity values of subjects taking test product compared to the placebo group, a significant increase in elasticity was observed at week 6 with the test product. This suggests the product may have some beneficial effect on the elastin network. In conclusion, this study demonstrates that daily consumption of the test product in its current formulation is able to induce a clinically measurable improvement in the depth of facial wrinkles, skin elasticity and hydration. Kligman LH. Photoaging. Manifestations, prevention, and treatment. Dermatol Clin 1986;4:517-28. Guercio-Hauer C, Macfarlane DF, Deleo VA. Photodamage, photoaging and photoprotection of the skin. Am Fam Physician 1994;50:327-32, 334. Naylor EC, Watson RE, Sherratt MJ. Molecular aspects of skin ageing. Maturitas 2011;69:249-56. Baumann L. Skin ageing and its treatment. J Pathol 2007;211:241-51. Heino J. The collagen family members as cell adhesion proteins. Bioessays 2007;29:1001-10. Myllyharju J, Kivirikko KI. Collagens and collagen-related diseases. Ann Med 2001;33:7-21. Gelse K, Pöschl E, Aigner T. Collagens - structure, function, and biosynthesis. Adv Drug Deliv Rev 2003;55:1531-46. Ricard-Blum S. The collagen family. Cold Spring Harb Perspect Biol 2011;3:a004978. Postlethwaite AE, Seyer JM, Kang AH. Chemotactic attraction of human fibroblasts to type I, II, and III collagens and collagen-derived peptides. Proc Natl Acad Sci U S A 1978;75:871-5. Prottey C. Essential fatty acids and the skin. Br J Dermatol 1976;94:579-85. Dykes PJ, Marks R, Davies MG, Reynolds DJ. Epidermal metabolism in heredopathia atactica polyneuritiformis (Refsum's disease). J Invest Dermatol 1978;70:126-9. De Spirt S, Stahl W, Tronnier H, Sies H, Bejot M, Maurette JM, et al. Intervention with flaxseed and borage oil supplements modulates skin condition in women. Br J Nutr 2009;101:440-5. Wefers H, Sies H. The protection by ascorbate and glutathione against microsomal lipid peroxidation is dependent on vitamin E. Eur J Biochem 1988;174:353-7. Pinnel SR, Murad S, Darr D. Induction of collagen synthesis by ascorbic acid. A possible mechanism. Arch Dermatol 1987;123:1684-6. Sumida E, Hirota A, Kuwaba K. The effect of oral ingestion of collagen peptide on skin hydration and biochemical data of blood. J Nutr Food 2004;7:45-52. Matsumoto H, Ohara H, Ito K, Nakamura Y, Takahashi S. Clinical effect of fish type I collagen hydrolysate on skin properties. ITE Lett Batteries New Technol Med 2006;7:386-390. Ohara H, Ito K, Iida H, Matsumoto H. Improvement in the moisture content of the stratum corneum following 4 weeks of collagen hydrolysate ingestion. J Jpn Soc Food Sci Technol 2009;56:137-45. Oesser S, Adam M, Babel W, Seifert J. Oral administration of (14) C labeled gelatin hydrolysate leads to an accumulation of radioactivity in cartilage of mice (C57/BL). J Nutr 1999;129:1891-5. Watanabe-Kamiyama M, Shimizu M, Kamiyama S, Taguchi Y, Sone H, Morimatsu F, et al. Absorption and effectiveness of orally administered low molecular weight collagen hydrolysate in rats. J Agric Food Chem 2010;58:835-41. Shigemura Y, Iwai K, Morimatsu F, Iwamoto T, Mori T, Oda C, et al. Effect of Prolyl-hydroxyproline (Pro-Hyp), a food-derived collagen peptide in human blood, on growth of fibroblasts from mouse skin. J Agric Food Chem 2009;57:444-9. Jacobi U, Chen M, Frankowski G, Sinkgraven R, Hund M, Rzany B, et al. In vivo determination of skin surface topography using an optical 3D device. Skin Res Technol 2004;10:207-14. Zhuang Y, Hou H, Zhao X, Zhang Z, Li B. Effects of collagen and collagen hydrolysate from jellyfish (Rhopilema esculentum) on mice skin photoaging induced by UV irradiation. J Food Sci 2009;74:H183-8. Eberlein-König B, Placzek M, Przybilla B. Protective effect against sunburn of combined systemic ascorbic acid (vitamin C) and d-alpha-tocopherol (vitamin E). J Am Acad Dermatol 1998;38:45-8. Brincat M, Kabalan S, Studd JW, Moniz CF, de Trafford J, Montgomery J. A study of the decrease of skin collagen content, skin thickness, and bone mass in the postmenopausal woman. Obstet Gynecol 1987;70:840-5. Affinito P, Palomba S, Sorrentino C, Di Carlo C, Bifulco G, Arienzo MP, et al. Effects of postmenopausal hypoestrogenism on skin collagen. Maturitas 1999;33:239-47. Adamiak A, Skorupski P, Rechberger T, Jakowicki JA. The expression of the gene encoding pro-alpha 1 chain of type I collagen in the skin of premenopausal and postmenopausal women. Eur J Obstet Gynecol Reprod Biol 2000;93:9-11. McGrath JA, Uitto J. Anatomy and organization of human skin. In: Burns T, Breathnach S, Cox N, Griffiths C. Rook's Textbook of Dermatology. 8 th ed. Oxford, UK: Wiley-Blackwell; 2010. Béguin A. A novel micronutrient supplement in skin aging: A randomized placebo-controlled double-blind study. J Cosmet Dermatol 2005;4:277-84. Choi SY, Ko EJ, Lee YH, Kim BG, Shin HJ, Seo DB, et al. Effects of collagen tripeptide supplement on skin properties: A prospective, randomized, controlled study. J Cosmet Laser Ther 2014 ;16:132-7.